The botanical name of the Easter Cactus houseplant along with its cousin, the Christmas Cactus, is enough to give anyone a headache. Don't worry though, where as many houseplants are called by both their scientific and common name, this plant is almost always known as the Whitsun or Easter Cactus. Names aside, it has beautiful knock out flowers that typically bloom during March and April. 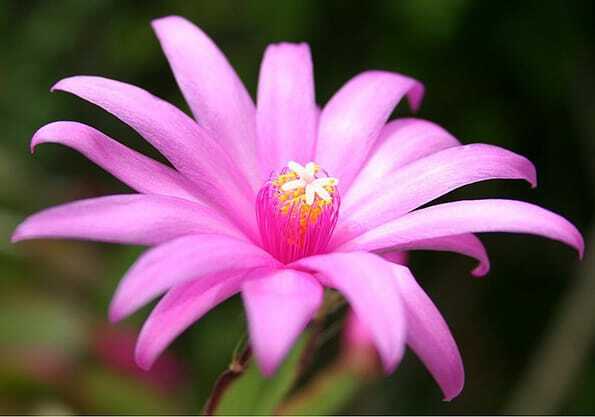 When not flowering the plant looks very like the Christmas Cactus and although both types are quite easy to care for and get flowering again the following year, the Easter Cactus is somewhat less popular as a houseplant. One theory is that because both species are very easy to propagate it was traditional to give cuttings as presents during the festive seasons of Christmas and Easter. Evidently Christmas allows a much more varied gift exchange which can easily include plants, where as Easter in the modern world is normally all about chocolate Easter Eggs and Daffodils! The more probable theory is that the Easter Cactus is harder to get hold of, because well in all honestly, it can be a little bit of a Prima Donna if not treated correctly. Dropping entire leaf "segments" in rage if not watered correctly and stubbornly refusing to re bloom some years, simply because it doesn't feel like it. Don't despair though, our guide will provide the care tips to keep it in a contented happy mood and give you the best chance to receive knock out blooms year after year. Average lighting; avoid giving it both deep shade and direct sunlight for prolonged periods. Deep shade will result in little growth and limited or no flowers. The Easter Cactus isn't a desert cactus though so direct sunlight must be avoided. Too much sunlight will cause reddish hues on the leaves. Like all cacti they can store water inside their thick fleshy leaves and live off this during droughts. However if you allow the soil to dry out completely for too long expect a strop as the plant will start shedding its leaf segments. Aim for constantly moist rather than wet soil and water with tepid rather than cold water. Sitting the pot in a pebble tray or misting the leaves a few times a month is recommended if the plant has been positioned in a dry environment (their natural habitat are shady, dank and moisture filled forests). 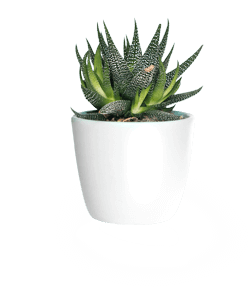 Feed during the growing season about once a month, an all purpose houseplant fertiliser will be fine. 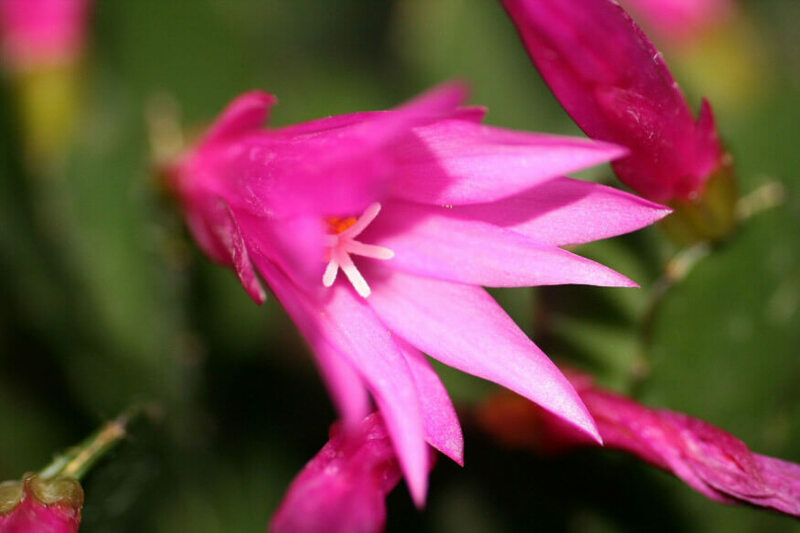 The average temperatures in most homes is perfect for the Easter Cactus. The plant needs to rest from October until early the following year, and this should take place in a slightly cooler, 7°C - 15 °C / 45°F - 59°F room. An unheated room would be the typical choice. It grows slowly and therefore takes a while to become pot bound. Repot after flowering in Early Summer if needed, but you probably won't have to do it more than once every few years. 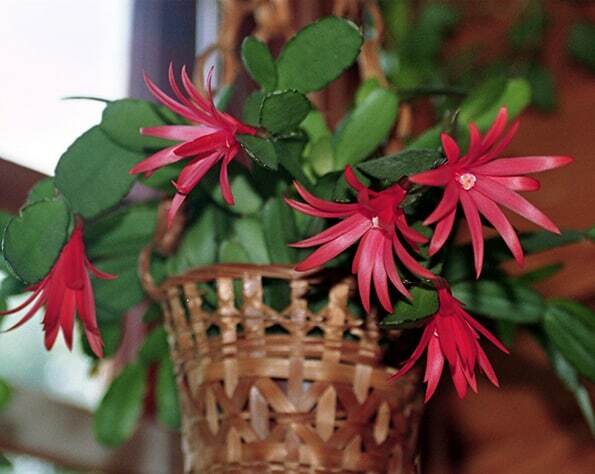 To propagate your Easter Cactus, in Summer you can cut off part of one of the stems with 2 or 3 "segments" attached. Wait a day or so for the cut to dry a little before inserting the lower segment a few centimeters / half an inch into a pot with compost. Make sure they go in the way they were growing i.e. the top of the segment should still be at the top when the cutting has been potted up. Aim to keep the cuttings only slightly moist (too much and they will rot). This is known as propagating by leaf cuttings. Slow but steady growth should be expected during the growing season. It's slow growing, but over many years it can become quite spread, but never very tall. Yes the Easter Cactus has flowers and yes they're truly a knock out, especially when they appear in mass. The secret to achieving loads of blooms from one year to the next is to move it outside. At some point between June through to August put the plant outside in a protected shady location. Exposure to the elements out doors hardens up the the new growth, which is needed before it can flower. 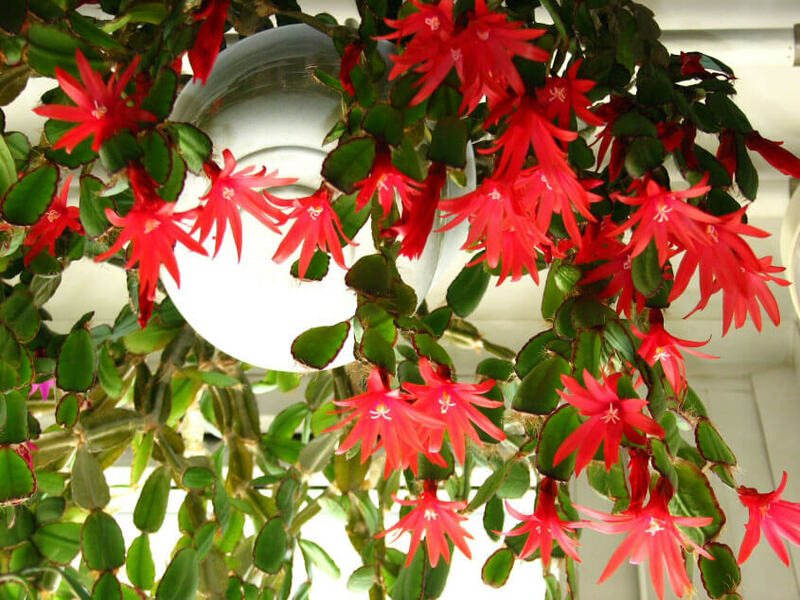 The Christmas Cactus conveniently lets you know when it has had enough by showing you its buds, however not so simple with the Easter Cactus because the buds won't form until early the following year. You'll just have to remember to bring it in when Autumn/Fall approaches rather than rely on the plant giving you visual clues. When you bring it in, find a cool (7°C - 15 °C / 45°F - 59°F) well lit spot in your home and let it rest. It won't need as much water in such a place but make sure the soil doesn't dry out completely. All being well, buds should start forming as the days begin to get slightly longer and warmer (February - March). Flowering usually occurs between late March to late May. Is the Easter Cactus Poisonous? The Easter Cactus isn't toxic to people, cats or dogs. When you put the plant outside for the Summer, ensure you protect against slugs and snails, which will take random bites out of the segments. The plant has been exposed to direct sunlight. Caused by Slugs or Snails! Easter and Whitsun change dates every year so it's incredibly tricky to achieve blooms at very specific times each and every year. Consequently if you must have them in flower at this time you may want to consider buying new plants in bud. See the flowering section above for the secret. Some years however, the Easter Cactus will just not want to flower even if conditions have been identical to previous years. Other causes may be that the plant is too old or the soil is depleted of nutrients. 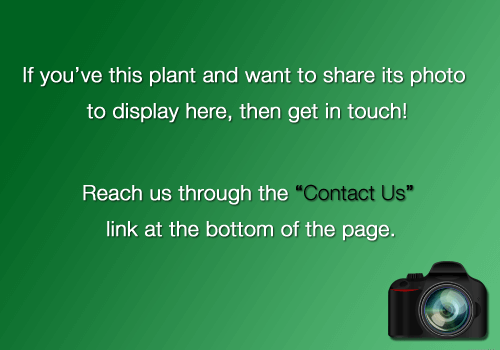 Repot / fertilise or propagate to create new plants. The plant may give up on its flowering attempt if it has run out of water (or had too much), remember to keep the soil moist. Once the buds have formed you need to move it to its display location where it can remain until flowering has finished. If you move it around in the late stage of the bud formation they can drop off.